Mobile usage is increased in these days and there are many network operators providing different services and offers to customers. Also the providers giving daily based special offers and recharge plans but you can get the details only by contacting dealers or sending SMS. Before you recharge your prepaid mobile, you have to find the most appropriate recharge plan for your exact need. iReff app is the quickest and easiest way to get the latest recharge plan and offer information. iReff is an Android app that helps you to easily know your Topup Vouchers, Special Tariff Vouchers (STV), Combo Vouchers and Full Talk Time offers. The app has very simple interface, initially you have to select your mobile operator and your telecom circle. The app will shows list of all topup plans and tariffs of other services. If you click a particular recharge amount, you will get the recharge plan details with additional information such as talktime, price, updated time, source and USSD string to activate it. 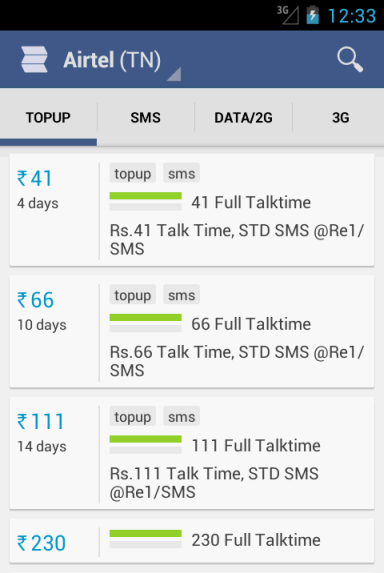 It provides recharge details with different sections such as Topup, SMS, 2G Data, 3G Data, Local, STD and more. iReff updates the recharge plans daily from the particular operator’s website. It supports 14 prepaid mobile operators and 22 telecom circles. 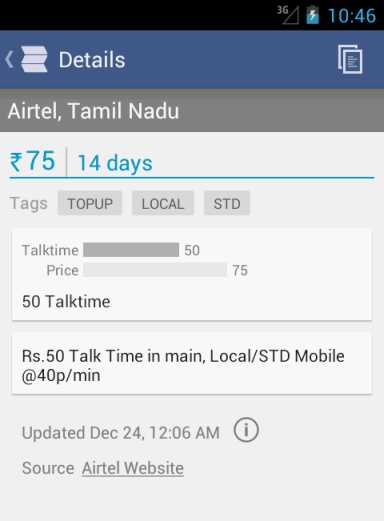 A dedicated search box to search recharge plans based on particular price range. You can also get the recharge plans and offers by sending SMS. Check the official site to know SMS commads. iReff app for Android is available free to download on Google Play. The app is currently in beta stage and it comes with ads, there is no pro version for this app.